PINOY PRIDE, the television’s mega boxing series is coming back to Davao City on February 7 for its 29th edition at the University of Southern Philippines Gym. “We are truly very excited in coming back here in Davao City,” said Michael Aldeguer, CEO and president of the ALA Sports Promotions International Inc. at yesterday’s launching of the Pinoy Pride 29: Fist of Fury. 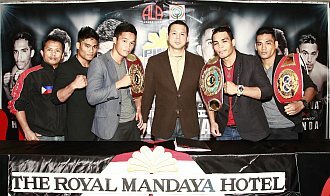 Also present to meet the press at The Royal Mandaya Hotel were reigning WBO International junior welterweight champion Jason “El Nino” Pagara, reigning WBO Intercontinental junior featherweight champion Genesis “Azukal” Servania, WBO and IBO International junior bantamweight champion “King” Arthur Villanueva, promising boxer Mark “Magnifico” Magsayo and ALA Boxing Gym head coach Edito Villamor. Pagara (34 wins-21 KOs, 2 loses) will defend his title against Mexican challenger Cesar “El Dolar” Chavez (23 W, 11 KOs, 7 L) for 12 rounds in the main event while the undefeated Servania (25 W, 11 Kos) stakes his crown against another tough Mexican Juan Luis “Perla Negra” Hernandez (17W, 9 KO, 3 L, 1 D). Villanueva, also undefeated in 26 fights with 14 KOs, gets his biggest challenge against former WBO world flyweight champion Julio Cesar “Pingo” Miranda (38 W-29 KO, 11 L, 2 D) in a 10-rounder. “This will be Villanueva’s biggest test. It will determine if he is really ready now for a world title-fight,” said Aldegeuer. Villanueva, also currently IBF International junior bantamweight champion is ranked no. 1 contender by the WBO and no. 3 in the IBF, no. 7 in WBA and no. 12 in WBC. Also seeing action is undefeated Mark “Magnifico” Magsayo, one of ALA gym’s most promising fighters. The 19-year old Magsayo (9 W, 7 K0) takes on Sukkasem Kiethyongyuth of Thailand in 10 round 126 lbs. bout. “Magsayo is probably one of our most talented fighters to watch,” Aldeguer said. Pinoy Pride is a partnership of ALA Sports Promotion International Inc. together with the Philippines biggest television network ABS-CBN. “This series was put up not just to showcase the Filipino athlete but the best of what the Philippines have to offer to the world,” Aldeguer said. ALA Promotions plans to have at least eight Pinoy Pride this year in Manila, Cebu, Davao, Dubai and USA. ALA Promotion’s first Pinoy Pride in Davao City was the 19th edition held April 20, 2013 at the USEP gym. The event lived up to its title “Mexican Invasion” as ALA’s prized fighter Rey “Boom Boom” Bautista lost his WBO Intercontinental featherweight title to Mexico’s Jose Ramirez in the main event. PINOY PRIDE BACK IN DAVAO. Click here to view a list of other articles written by Lito delos Reyes.